Be Part of "Nine for Number 9"
The Railway is proud to host Sir Nigel Gresley's A4 Pacific locomotive, No. 60009 "Union of South Africa" during the "Giants of Steam" Gala, 12-14 Oct., 2018. This iconic, streamlined locomotive, which used to work on the East Coast main line, is sadly due to retire early in 2019, so this is probably one of the last opportunities to see her under steam in the South East. During its career, No. 60009 worked all the named expresses that used to operate to, from, and through Edinburgh's famous Waverley station, and the Bluebell Railway will be recreating all nine of them over our three-day event. The Aberdonian: 12 October @ 10:00 a.m. The Elizabethan: 12 October @ 12:45 p.m. The Flying Scotsman: 12 October @ 3:30 p.m. The Heart of Midlothian: 13 October @ 10:00 a.m. The Night Scotsman: 13 October @ 12:45 p.m. The North Briton: 13 October @ 3:30 p.m. The Queen of Scots: 14 October @ 10:00 a.m. The Talisman: 14 October @ 12:45 p.m. The Waverley: 14 October @ 3:30 p.m. The cost of this unique, once-in-a-lifetime package is £750. It can be bought, subject to availability, by an individual or group, or as a perfect gift. Call our customer service team at 01825 720800 to reserve your sponsorship opportunity. No. 34059's boiler leaves Sheffield Park on 23 Oct., 2013. Boilers are one of the major items of a locomotive that have a varied career. With the West Country and Battle of Britain classes, some locomotives-for example No. 34002 "Salisbury"--had six different boilers during their working lives, while others--such as No. 34092 "City of Wells" and No. 34102 "Lapford"-ran with only two boiler changes. 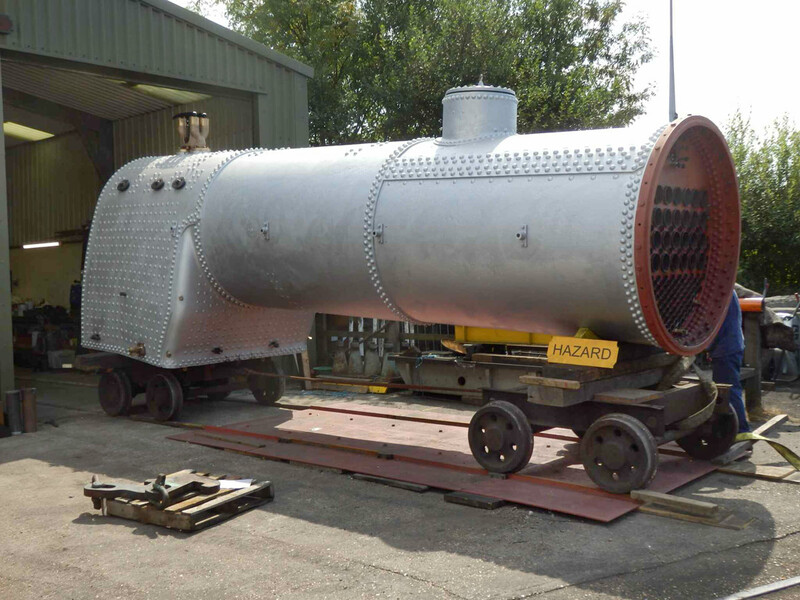 The newly overhauled boiler arrives at Sheffield Park on 9 Aug., 2018.
oiler for an overhauled item or to bring forward an overhaul to encompass a boiler exchange. No. 34059 "Sir Archibald Sinclair" ran with four different boilers during her 19-year life with the Southern Railway and the Southern Region. Built with boiler No. 1313, the engine entered traffic on 3 April, 1947, and two years later on 29 Jan., 1949, having run 67,288 miles, her boiler was changed for No. 1307 during a general overhaul. This boiler started life with No. 21C153 "Sir Keith Park", which at the time of her boiler exchange was undergoing her first general overhaul, having run 92,482 miles since entering traffic on 1 Jan., 1947. The current boiler fitted to No. 34059 is boiler No. 1285, originally fitted to No. 21C127 "Taw Valley". This change of boiler occurred at the engine's general overhaul on 22 Feb., 1960, when the engine was modified or rebuilt to her present form ... MORE . From the Bulleid Society webpage : This photo shows the first of many top coats applied to the western side of coach No. 5738. No top coat has, as yet, been applied to the eastern side of the coach. Internally, the final batch of reupholstered cushions is awaited, and much of the interior is now completed. Work on the bogies is progressing, with fitted bolts for the horn guides awaited and new brake cross shafts are being machined. "Earl of Berkeley", the "Dukedog", was a guest of honour at the Goodwood Revival from 7 to 9 Sept., 2018. Lance Allen, who took the photo, writes, "The loco was positioned where tens of thousands of Goodwood visitors saw it. Although not in steam, an energetic steam and sound generator was in use, and the loco was 'manned' by actors posing as porters or char-ladies! The South Downs Light Railway was also present with a miniature running track." Thank you to all of you who have put your names forward to volunteer as stewards on the Santa Specials this year. We have had a pretty good response from volunteers, with more than 50% of the shifts now covered. However, this unfortunately still leaves more than 100 shifts still to fill in particular the East Grinstead service. So just a reminder that we still require volunteers to act as stewards on 1, 2, 8, 9, 15, 16, 22, and 23 December, as well as on a special "Train Before Christmas" service on 24 December. 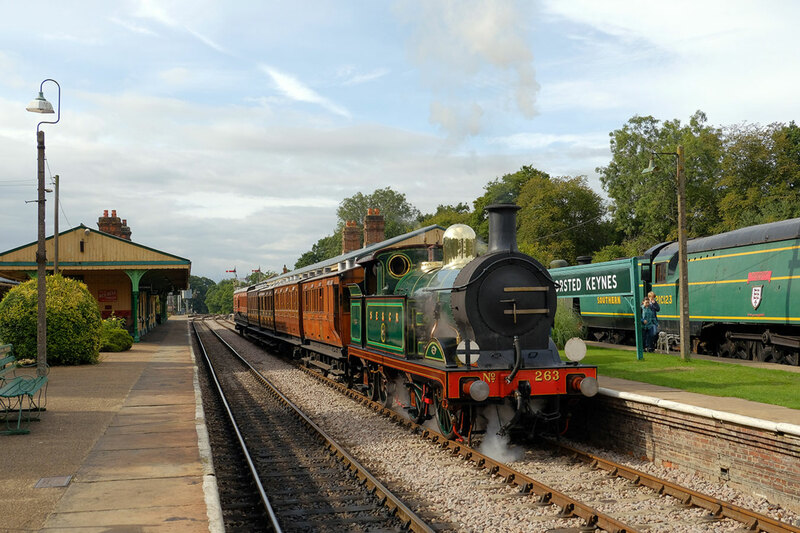 Your role will be to serve refreshments and to look after our visitors during the train journey to and from Horsted Keynes while being a smart and friendly face of the Bluebell Railway. Even if you can give up one day it will make a difference. Tickets are already on sale and initial indications are pointing towards another great success. So, if you are interested in joining us this December as a steward either again or for the first time please e-mail me at keith.riggs@bluebell-railway.co.uk with your available dates. It is my intention that in late October or early November, I will arrange a get together of all the stewards so that everyone can meet each other and discuss their roles. The new Back-Lock Timer Indication, returned to its signal box after an absence of 33 years. Kingscote Signal Box has now been operational for more than 30 months, and during this time, both the signalman and S&T staff have been learning the foibles of working a miniature lever power frame. One issue that has befuddled most is when a signal lever needs replacing without a train passing; this happens more than one would expect, particularly when testing. Signal levers can always be partly replaced, and this action replaces the signal arm or aspect-to-danger for emergency situations, but then the lever will be held on the back-lock, holding the locking for a predetermined time in case a train is approaching. Once the time has elapsed (up to 180 seconds), the lever lock will buzz, and the lever can be fully replaced. Unfortunately, experience has proved this buzz varies in tone and volume and can be overwhelmed by ambient noise. Trying to replace the lever before the timing cycle is complete can reset the timing circuits, enforcing another full time period. I think it is safe to say that most signalmen have experienced this frustrating situation at some time or other, and if wrongly diagnosed, it could suggest there is a fault leading to unnecessary and risky hand signalling procedures. To minimise risk and to help the operators, the S&T engineers studied a number of options to remove this anomaly. After consultation, they came up with a simple common indication that illuminates during any timer cycle; the signalman then only needs to attempt to replace the lever when the lamp is extinguished. During the development period, a member of a visiting group from the Signalling Record Society offered me a brass indicator that he believed had come from Brighton Upper Goods (UG) signal box. Of course, this is where the top half of Kingscote signal box originated from, and we thought it would be nice for the indicator to return from whence it came. Research confirmed that indeed it had come from Brighton UG, and not only that, the lamp indication was driven from Brighton (a station signal box that was also an "L" frame). The device had been provided to indicate when a slot had been sent from Brighton to allow a move from the siding onto the main line, and it was in use between 1932 and 1985. The new indication was commissioned at the beginning of September, taking more than 10 volunteer manhours to design and check and 50 volunteer manhours to install and test with material we had in stock, resulting in zero cost to the Railway. Atlantic Group Update: Coming to a Boil! We have recently moved the boiler outside of Atlantic House for the final work to be carried out in preparation for its hydraulic pressure test. Due to lifting and space restrictions within Atlantic House, we are likely to virtually finish work on the boiler while it is outside in its present position. At present on order from outside contractors are the rolled plates for the smokebox and all of the folded and flat parts required to make up the ashpan. The space within our workshop made available by the boiler's exit will enable work on these two items to be continued inside. Meanwhile given reasonable weather, we are now also working on the crinolines, which will eventually support the boiler clothing sheets. Our present plan is to assemble these parts together with the smokebox and ashpan to the boiler. Then with the clothing sheets temporarily removed, the final hydraulic test can be completed prior to the reinstatement of the clothing, followed by its installation in the chassis, again using a mobile crane. Finishing work can then be done in Atlantic House without impinging on the space in the main works that is better utilised for repair and overhaul of existing locomotives. At present work is progressing on the piping up of the tender chassis, prior to the fitting of the tank and coal space. Final drawings for these components are well in hand, and we hope to get the whole basic welded assembly made by outside contract, ready for us to apply the more tricky riveted details on it being delivered to us. Obviously none of this is written in tablets of stone and is subject to changes depending on circumstances ... MORE . Have a Very Horsted Christmas! New for 2018! Visit the Railway this December for a very special Christmas treat! Travel onboard a steam-hauled train in your own private compartment and enjoy your delicious Christmas hamper, packed full of festive goodies. Alight at Horsted Keynes, where the sparkling fairground stall lights and music from the vintage organ create a magical atmosphere. Why not try your hand on the Victorian fairground stalls? Or visit Father Christmas in his parlour! He'll happy to have a chat, and don't forget to collect one of the special presents he has for all the children. Not to be left out, Mother Christmas will be busy helping little ones make lovely Christmas cards and decorate gingerbread to take home with them. As Father Christmas is busy, his reindeer will be building up their strength before the "big evening", so why not visit them and wish them well! Plus ... don't miss the festive storyteller or the puppet show and don't forget to collect your complimentary mulled wine or hot chocolate from the buffet to keep you going! We're off to the Isle of Wight this time. Tony Hillman presents Alan Postlethwaite photos from the island, along the line from Ryde to Ventnor. Taken on 6 April, 1960, an Easter Saturday service pulled buy 02 W31, at Brading. Roy Watts' photo shows the 09 hauling a Shareholders' Special: the 9:09 a.m. service on the 9.9.18. "It was 999 day!" says Roy. P Class: "Practice and Performance"! Some years ago, I did a spot of writing for Bluebell News that contained the words "Thou shalt not use P class on express passenger work"! This phrase arose from an occasion in February 1985 when, while waiting on the up platform at Sheffield Park, I witnessed the P class No. 323 "Bluebell" arriving on a 3-carriage load. The point being, the actual arrival was ever so slow ... obviously it had been "a rough trip"! "Normandy" is one of Adam's design of standard dock shunting engine, being a short but heavy tank, with only four wheels arranged on a short wheelbase to cope with sharp curves. In 1891 the London & South Western Railway bought out the Southampton Dock Company, thus obtaining control of most of the port of Southampton, their major source of goods traffic. To operate the largest railway owned port required a sizeable fleet of shunting engines. The motley collection of engines absorbed from the Dock Company were mostly disposed of and to replace them a further 10 B4 tanks were constructed at Nine Elms works in Battersea. No. 96 is one of this order. These docks engines were distinguishable by having open sided cabs, carrying names of cross channel ports and often running without numbers. They were used exclusively for dock work, having their own shed within the docks perimeter and for many years being maintained by the dock's workshops. No. 96 was a dock engine until replaced by the recently purchased war surplus USA tanks in 1947. It still had a stovepipe chimney at this time, but the cab had been enclosed as an air raid precaution. Many of the class were now surplus, withdrawn and sold, but 11 were still in use in the mid 1950s to be gradually displaced by small diesel shunters. Their last duty was shunting in Winchester goods yard where nos. 30096 and 30102 worked until withdrawn in October and September 1963 respectively. Both engines were sold, No. 30102 for preservation and No. 30096 for further use by Corralls, the fuel merchants, on their private wharf at Southampton. Charlie Scullin: "The A set at East Grinstead on 13 Sept., 2018, before the 4:45 p.m. departure, with Bill White, two Daves, and me as guard." Brian Lacey's photo , taken on 8 Sept., 2018, shows the SECR H class at Horsted Keynes with the vintage set. 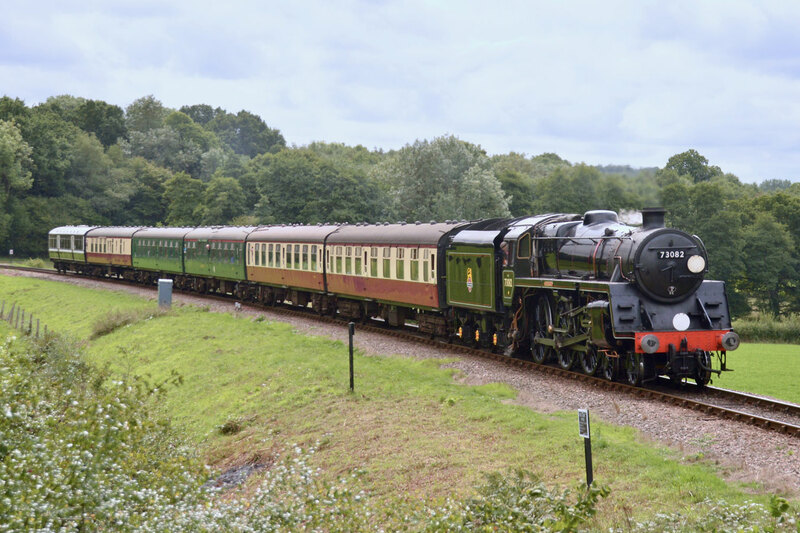 Steve Lee's photo from 8 Sept., 2018, shows Camelot approaching Horsted Keynes with the 1 p.m. service from Sheffield Park. John Sandys (13 Sept., 2018): "A lovely autumnal day with the Q class hauling the Service Train, carrying a headboard tribute to the late John Jesson (1937-2018): in memory of a good friend of the Bluebell Railway and a Project Leader for No. 84030." John Sandys (6 Sept., 2018): "Quite a nice autumnal day saw the Q class on the Service One schedule today. A visit to Kingscote Station, looking immaculate as usual. Also a few shots at East Grinstead." Jonathan Hughes (7 Sept., 2018): "Today's evening supper service coasts around Freshfield Curve in the evening sunshine." "A Summer of Southern Steam" by "TheSoutherner": "Whether you like the Southern Railway or not, there is no denying the rich character the Southern region had. From Drummond to Bulleid, the Southern Railway and its predecessors produced many groundbreaking, breathtaking, and occasionally quirky designs." Vintage Bus Running Day is on 7 Oct., 2018. Preliminary timetable information about some of the Free Bus Services is now available to download . "Dukedog" was spotted at Goodwood on 5 Sept., getting ready for the Goodwood Revival, "the only historic race meeting to be staged in period theme". Photo by Peter Mellersh. One of the photos from the Science Museum's Wolverton Carriage & Wagon Works photo archive. This is a collection of 487 silver gelatin glass negatives 8� x 6� ins, from the Wolverton Carriage Works, featuring London Midland & Scottish Railway carriages, c. 1928-1936. Includes negative register, foolscap covers, approximately 100 pages. Wolverton Carriage & Wagon Works was built as a locomotive repair shop for the London & North Western Railway in 1846. In 1877 all locomotive production was transferred to Crewe and the Wolverton site was from then on used for the construction and refurbishment of carriages, wagons, and road vehicles. Following the 1923 grouping, this role continued under the London Midland & Scottish Railway. During World War II, the works also built aircraft components, assault craft, and armoured vehicles. Wolverton subsequently produced rolling stock for British Railways, together with Post Office sorting vans and saloons for Queen Elizabeth II's royal train. Young boy on a train , standing by the driver. LNER V2 2-6-2 No. 60961 in a railway workshop with trains being built. Scene of NER B16 4-6-0 No. 61415 being broken up at a rail scrap yard. English Electric diesel D208, a "Deltic", the "Midland Pullman" and electric locomotive E3079. Waiters on the Midland Pullman train serving passengers. The 2018 Murder Mystery Pullman Train evenings have added a new date (12 Dec., 2018) and details also now available to download for 2019 . The maximum possible number of trains capable of being operated over a line in one direction. Usually expressed as trains per hour, it will depend on all trains running at the same speed, having equal braking capacity and on how the signalling is arranged. A short video taken on 4 Sept., 2018, at Sheffield Park. 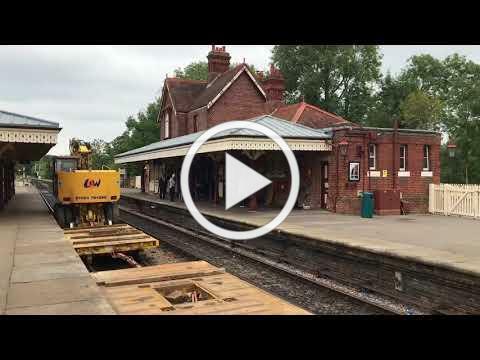 It shows a road/rail digger waiting for the Q class locomotive to arrive at Sheffield Park before leaving on the single track line to Horsted Keynes, by "UKWMO". Take a ride on a steam train at @Bluebellrailway or step back to Roman times at @BignorVilla. Discover the county's top cultural hotspots from out hand-picked list of days out. A big thank you to @bluebellrailway for providing their steam locomotive for the #GoodwoodRevival last week! I know I bang on about circuits not making an effort with their appearance, but check this out, Goodwood has a steam train brought in just for Revival. It's the first thing you see when you come through the entrance, puts you in the mindset this is a cool place, and it really is. Proud of the boy @JCCharman - he's arranged a visiting engine for his gala, which just happens to be the #GoodwoodRevival! @bluebellrailway thank you very much for a beautiful birthday experience! I'm very inspired to volunteer!